Is Healthcare Interoperability Possible With a Conflicted Federal Committee? But one politically connected left-wing company, Epic Systems, could destroy this healthcare progress. With over $19 billion in stimulus money being dedicated to health IT, the selection of members to occupy the Health Information Technology Policy Committee was a crucial one for the Obama administration. And a platform of interoperability isn’t exclusive to the Obama camp. Democrats, Republicans, and industry experts alike recognize the importance of interoperability. So why, despite their public support for interoperability, did the administration appoint to the HHS board Epic Systems CEO Judy Faulkner, who opposes the broad consensus position on interoperability? He also believes that after working with Epic for a couple of years, there is little to indicate that their software is unique in the industry. “I have not seen anything specific to Epic, not found elsewhere that could set (them) apart from other competing EHR/EMR systems,” Chaudhry explains. In fairness, the entire industry is, according to Otech President Herman Oosterwijk, “15 years behind in interoperability compared with PACS systems”. PACS (Picture Archiving and Communication System) is a technology that allows medical images and reports to be stored and transferred electronically. Andrew Needleman, president of Claricode Inc., acknowledges difficulty with the implementation of interoperable EHR systems. Rob Quinn, a partner at APP Design, a software development company, says the office of Health and Human Services “is trying hard to get vendors to communicate via standards,” though he doubts many health IT companies like Epic will comply. “There’s simply too much money to be made in locking in their clients,” Quinn admits. In the end, Needleman isn’t sure if the appointment of Faulkner crosses ethics boundaries, but says a conflict of interest may be unavoidable. The appointment of Faulkner poses a significant challenge for the Obama administration. Her opposition to interoperability creates difficulty for the advancement of the health IT industry. The market should decide whether the Epic Systems approach to health IT should be rewarded or deprecated, but – in the interests of interoperability and political integrity – HHS should immediately ask Judy Faulkner to step down from her role on the HHS Health IT Policy Committee. Is Meaningful Use Enough When Disaster Strikes? Within the last 12 months, natural disasters have taught the health IT community the necessity of preparation. We’ve seen tsunamis threaten nuclear disaster; tornados wipe out entire communities and hospitals; earthquakes damage national monuments; and hurricanes effect remote coastal towns. In the wake of Hurricane Irene’s flooding and billions in damage, I truly wonder what we can learn from this experience in an effort to make the next disaster … less of a disaster. When I think of disasters, I think of recovery. In health IT, how do we clean up and recover from the unexpected? How do we recoup data, tests, records, history, systems, schedules, hardware, software, and all the technical things that make our facilities run? Katrina occurred six years ago, yet some areas of New Orleans are still cleaning up. Virginians can tell you all about the unexpected now that they’ve experienced an earthquake in their back yard. And who can forget the tragic images of Joplin, Missouri, where St. John’s Regional Medical Center stood directly in the path of the monster EF-5 tornado? Thankfully, St. John’s had just switched to an electronic medical record system, though it reportedly sustained some permanent paper record loss. We’ve already heard reports of IT-related problems stemming from Irene with offsite centers and backup generators failing along with general logistical and access issues. Unfortunately, after the dust settles, we’ll likely hear of communication outages, lost patient records, and failed technology – a story that is become a bit too familiar. Having learned from past disasters, many large facilities have business continuity plans in place to restore their operations quickly. They have online data storage backups and cloud-based hosting facilities to mitigate minimal interruption and risk. But what about those that don’t? Many physicians and hospitals across the country continue to lack capital and access to advance to technology typically afforded to large hospitals. Many find it challenging to meet the noble intentions of Meaningful Use, which is designed to do just that. Reach the communities that don’t have the funds or access. Long-timers in health IT know that implementation and adoption of new technology can be S-L-O-W. So when exactly is the appropriate time to hold ourselves and our vendors to a higher standard of safety, data recovery, and connectivity over finances? What measures do we enact to safeguard our IT investment before a catastrophic event strikes? Moreover and most importantly, how do we help those caregivers in need RIGHT NOW of information technology? For example, cloud technologies are words that scare us. We think liability and compliance obstacles instead of opportunity and solutions. Flexibility is paramount. Many organizations are in critical risk positions because archaic and poorly funded IT processes and architecture are wrapped around one very inflexible platform. In allowing the unknown to stop us from proactively seeking out sustainable solutions, will we allow history to repeat itself the next time a natural disaster crosses our path? Creating flexible and efficient solutions provides the foundation for innovation and problem solving. Remember, if your vendor doesn’t play well with others, Mother Nature will force you to figure this out. Patients rely on the entire continuum of healthcare to do one thing – deliver great care. Doctors, nurses, and administrators can’t deliver great care without depending on their arsenal of tools and technology in their greatest time of need. Let’s challenge ourselves to be innovative and redefine Meaningful Use in ways to help all providers regardless of size and limits, both at work and in our communities. I believe it’s worth the effort. Eric Mueller is president of WPC Services of Seattle, WA. Is It Only CPOE, or Is There More? We’ve got to think about what is ahead of us more holistically. CPOE is no longer a standalone project. If there is one common denominator amongst any size hospital that is embarking on this journey, it is the fact that the effort is considerably underestimated. Unless you have directly experienced projects of such magnitude, it is natural to treat and plan for this project as you would for any other. What makes CPOE so different? It is often a multi-year process, especially for larger organizations. It has clear beginning, but not an end. It impacts every operational aspect of a hospital’s business. Above all, it leads to significant clinical transformation efforts that are not welcomed by providers and clinical staff. Adding to the complexity of delivering CPOE within the Meaningful Use timeline is that all of the clinical components targeted for Stage 1 interrelate. We have two significant integration points: (a) the integration of the CPOE application with the appropriate modules and technologies (lab, radiology, pharmacy, documentation, ED, medication reconciliation, discharge instructions, etc.) and, (b) integration of clinical workflows. The latter is more challenging. 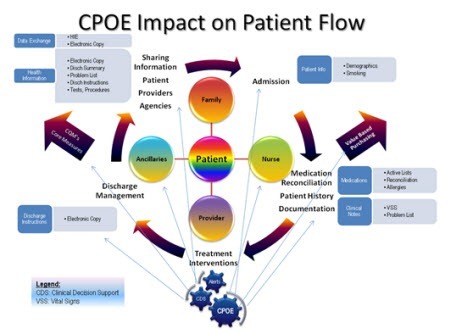 The easier question that organizations should ask is not what CPOE impacts in a hospital, but what it does not impact. That answer is by far shorter. To drive successful CPOE implementation, we know that the leaders have to be involved to “pave” the road and set direction. To achieve Meaningful Use Stage 1, a cadre of leaders — including the CEO — need a working knowledge of the requirements and organizational changes necessary to succeed. An IT strategic plan aligned with the vision of the organization should be in place at the time Meaningful Use projects are executed. For successful organizations, their strategic plan is centered on the patient and how to maximize clinical performance, the need for increased transparency, pay for performance, provider engagement, and building and expanding business intelligence capabilities, to name a few. This calls for resources, innovative technologies, and infrastructure, as well as a strong leadership team that is able to drive such a vision. The CIO’s role in the execution of the vision is essential. To successfully attain these goals, the infrastructure must support all these clinical and revenue-generating applications and the new tools that optimize the care delivery process. Someone made the analogy that the infrastructure is like a garden — cultivate it and it will produce expected results, but ignore it and the weeds will take over. As we plan the budgets for these initiatives, although we lead with saying that these are clinical applications and we need to focus on clinicians, we cannot minimize the importance of reliable infrastructure. In the big scheme of things, what does CPOE impact? Putting it simply, it will impact everything that a provider order does today. Moreover, if what happens today is not functioning at the most optimum levels, then CPOE will accentuate all inefficiencies, resulting in potential barriers towards its adoption. Even processes such as the timely assignment of the appropriate provider to a case will impact CPOE, as any delays or inaccurate information will cause disruptions in communication, delays in care, inaccurate physician performance reporting, billing, etc. Another critical factor is the fluency of clinical processes related to patient flow, especially at the points of entry through ED or PAT/surgery. As an example, take the efforts of trying to integrate CPOE with a disparate ED system while fine-tuning the medication reconciliation processes. In most cases, the result is a mixture of new processes that could still place patients at risks, unhappy providers if they have to use multiple systems, and budget overruns. Time is a precious commodity – neither the patients nor providers want to waste it. How do we plan for CPOE? It is by beginning with the end in mind and creating a patient-centric implementation. CPOE has to be safe, should optimize our clinical performance, and improve organizational efficiency. It is complex, but we can simplify it by always asking the question: will the patient and provider/clinicians benefit from it? If the answer is yes, then we are on the right track. I mapped a visual diagram on how to think about the Meaningful Use components in parallel with what is happening to a patient when admitted to the hospital. This will provide a reference of thinking about what we do in a different way. 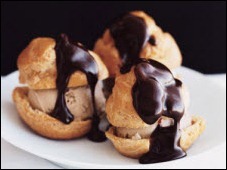 And of course, I did not forget about another delicious recipe you could try as we are approaching the end of the summer. I know this has nothing to do with CPOE other than finding a way to relax after a long day at work. And next time, we will talk more about provider adoption, organizational culture, and how to look for that value proposition. Daniela Mahoney RN is vice president of Healthcare Innovative Solutions of Seville, OH, A Beacon Partners Company. The Personal Health Record (PHR), in theory, is one of the best ideas in healthcare. Not only in terms of value (think of Facebook and Twitter’s skyrocketing valuations), but also in terms of patient care. As a depository of information, medical records would be easily accessible by patient and provider alike, with medications, procedures, and diagnoses always being accurate and up to date. Unfortunately, the PHR is the unicorn of healthcare IT. There have been some valiant efforts, but everyone seems to miss the key reasons why this fantastical PHR will remain just that, a fantasy. Facebook will never step into the healthcare arena. Sorry, folks, it is just not going to happen. Facebook is fun, exciting, and laid back. Unless you feel reviewing friends’ home medication list and procedure history is really something that most people would enjoy doing (and if you do, I think you might be in the minority on that one) venturing into healthcare IT would be an extreme departure from Facebook’s prior success strategy. I, for one, am interested in seeing what the next few years bring in terms of PHR strategy. I think there is an option out there that will work, but it definitely has not been created yet. Ryan Parker is implementation practice director of Preceptor Consulting Corporation of Fort Myers, FL. I have to give Mr. Weiss a lot of kudos for calling out what a large majority of HIT professionals have been saying internally. A lot of people in the HIT business will remain silent on this apparent conflict of due to not wanting to appear petty. For those in the business, we clearly see that Judy has the EPIC train running full steam, and there is not a vendor out there that is not listening to her footsteps as she confidently comes into their turf. And she has every right. She has had a strategy for years, stuck to it, and is now reaping what she sowed. That said, the EPIC approach to integration is that it is ‘all us’ or nothing. That is not what the goals of interoperability were and are. Interoperability is a kink in the EPIC armor and EPIC knows that. If you can successfully share data in a way that allows for patient data to be safely and quickly be shared, the concept of a single vendor system loses its appeal… especially one that has a high cost. Whether she should step down to seen as someone who is beyond reproach will be her decision, I really do not think that the HHS actually do anything. One suggestion is to have the HHS board appoint other large and small HIT vendor executives to the board so that a broader perspective that is much more representative of the reality faced by health systems is openly discussed. Aligning diversity is a core principle of interoperability, and while the board membership is diverse, having Judy as the sole representative of the major HIT vendors does not really align with that concept. I can only hope that being a single voice in that large group, her opinion will be somewhat muted. Rusty Weiss’ comment on Judy Faulkner appointment to the HHS board — given Faulkner’s stated rejection of interoperability — raises an important point. It matters not if Ms. Faulkner is right or left of Attila the Hun or Joe Stalin. What Mr. Weiss failed to note is that the ONC appointed Carl Dvorack, Faulkner’s COO, co-chair to the HIT Policy committee. Epic has significant control of the HHS agenda. On the other hand, are they any less self-serving than Cerner or any of the others? Faulkner’s 2009 comment referred to a problem within an organization–not an interoperability issue between different organizations. Her comment was reported by BusinessWeek, not Bloomberg News. I don’t mind criticism at all, but please feel free to argue the merits and substance of the article, rather than assuming the information is biased. I do actually have credentials in the Health IT, software, and laboratory fields, so I welcome your counterpoints. That link is to a Businessweek article yes, which is a part of Bloomberg News. And while the problem was within one organization, it was between two separate sections (physician orders and pharmacy records) that used two different and incompatible software platforms. Those comments, whether within organizations or between organizations still read the same way – different vendors are incompatible, so using Epic throughout is the solution. Ms Faulkner isn’t even on the HIT STANDARDS Committee – they run independently. The question I ask as a tax payer is – Why on earth did ONC spend almost a BILLION dollars between State HIE grants and separate Beacon Grants (600M and 250M respectively in round numbers) WITHOUT REQUIRING A SINGLE DEFINED STANDARD? Oh… and your quotes and references – be serious… they are a biased joke and the ones that aren’t are quoted out of context. There is evidence (Killbridge) on the patient safety aspects of trying to interface separate pharmacy and order entry applications that weren’t built to work together. Patients die all the time and it is a sad and avoidable situation. If interfacing was the panacea you suggest – surely it would have been accomplished by now and those who had accomplished it would enjoy the lifestyles of the Zuckerbergs, Gates and Jobs. It simply doesn’t work they way you suggest. And, by the way, Epic touts some pretty big numbers of interoperable sites across the country using standard IHE XDS.x protocols implementations and as well has live sites connected to the NwHIN and I saw a press release last week on Epic and the DoD/VA connection with MultiCare in Tacoma. Stick your head back in the sand for now and wait until you latch on to a juicier worm than Judy Faulkner to come back up for air. She’s a home spun do-gooder with an great business acumen. Wish we had more like her! Rusty, go back and research the accomplishments of HITSP under the last Republican administration’s watch (Bush – Brailer & Kolodner). The interoperability disease is most definitely bipartisan. And, where is the shining beacon of success from the VA and DoD? They have completely failed at interoperability where our service men and women and veterans need it most! They had access to (and squandered) unlimited funds attempting it. And this was (and is) a key issue identified by both Congress and the White House through 20 years almost evenly split between the Dems and the Reps control. After another BILLION or so tax payer dollars there all we have to show for it is a non coded ASCII text file extract from Peter Levin quaintly called the Blue Button. Mark – is that “large majority” you refer to the 45 % from Mr H’s poll on a Judy a week or so ago? I think the polling results were 55% not too much influence and 45% the other way. Given the readership here – that would be an expected result given the vendor (aka Competitor) and customer readership split. Despite some issues with Rusty’s article, the fact remains that Epic, like many EHR vendors, does not support widespread interoperability with other vendors’ systems. For obvious business reasons. One would hope that Judy (and Carl Dvorak) could set aside their Epic-centric agendas to advise ONC on how to achieve the nation’s goals around interoperability, given their inside knowledge of vendors operate. I’m suprised that no one brought up Carl Dvorak of Epic remains Chair of the EHR (Vendor) Association (EHRA), while also serving on ONC’s Federal Advisory Committee. Of course what’s good for EHR Vendors is good for the nation…right? I like your arguments, and I think the article even mentions that the problem of interoperability is a bipartisan problem. However, the quotes you refer to are not out of context in the least. The first one comes from the Examiner article and not from me, while the others are from direct conversations with the CEO’s. If they believe they were quoted out of context they are welcome to contact me. The Businessweek article was written before the magazine was acquired by Bloomberg. It is incorrect to say that Faulkner made her comment to Bloomberg News. Integration between physician orders and pharmacy is vastly different from interoperability between different organizations. So as we move towards 2012 this place starts getting political again. Well when I say political I mean conservative/libertarian. Weiss is a clear political operative, there is no balance in anything he has written that i can find. It’s basically all anti Obama, Muslims, Democrats. [From Mr. H] I don’t censor reader submissions unless they are clearly pitching a product or company. Readers Write articles are often opinion pieces like Letters to the Editor — I run what I get and any reader is equally welcome to express his or her thoughts via the same forum (or, to much less effect, just complaining that the other guy wrote something they don’t agree with). As long as the central theme is healthcare IT, then it’s fair game. Outstanding. Its about time somebody stood up to the politically connected elitist JF. Interoperability across disparate systems, to Judy, is the devil. Not So Fast- Can you provide a link to the Epic/DoD/VA/MultiCare press release you refer to? It’s not really an issue of censorship, it’s an issue of background. In the comments you have railed against people like Suzy RN posting the same anti-screeds again and again. Knowing Rusty’s bias he is just searching for an angle to criticize political liberals. This time a spurious quote about something hard to tie to interoperability. A huge stretch. It just so happens he shares a political view with you. Anyway its good to know. I will be submitting my Ron Paul, Palin, Tea Party HIT article next week. I guarantee you it will be biased in advance and fully expect it not to be censored. Look folks, HIT is all political. It is about a takeover of that percentage of the GNP devoted to health care by businesses and people who really have nothing in mind other than their power and greed gratification. By the way, I found the hopelessly complex diagram of CPOE flow to signify meaningfully dangerous issues for all sick patients. That device should be eliminated. Politics aside, Rusty’s article was a refreshing view of interoperability in healthcare. Why does it take an “outsider” to state the emperor is not wearing any clothes? Some of the largest barriers to interoperability are the dominant HIS vendors whose primary interest is protecting their domains. Every vendor will claim to offer HL7 interfaces and Clinical Document Exchange capabilities. However, asking for integration for a competing solution results in prohibitive pricing, long delivery times and heavy restrictions on custom components that would provide true integration that benefits the patient. It is very unusual to find an organization that has a single vendor environment. Interoperability must succeed. It is time for the healthcare IT community to push back against the monopolistic actions of the major HIS vendors. Judy is talking about a medication administration interface. Here is an Epic white paper giving the reasoning behind not attempting a MAR interface. So Rusty, argue with the points. Why do you think she is wrong? Because I have experience in this field and I say she is right. For medications to appear correctly in interfaced systems, all changes to orders in Epic would need to be replicated in the external system by discontinuing the existing order and replacing it with a new order containing the revised information. Another complexity is that both administration records would need to be kept in an identical state. This would require a bi-directional administration interface because every administration from one system would need to populate the other system immediately. There are serious issues regarding which changes would be respected if both records were accessed at the same time. Problems arise when the systems store data differently, and when one system needs data that the other system cannot provide. Information mapping and the subsequent issues that would result from attempting to interface two MAR systems is yet another critical consideration. System synchronization would need to be maintained; building and maintaining two identical yet separate sets of data for records such as medications, NDCs, frequencies, allergies, and alerts would require substantial effort. Additionally, there would be ongoing maintenance for upgrades. Upgrading one system would necessitate changes in the other. As stated previously, certain data could not be supported due to the nature of the interface. As a result, there would be functionality in one or both systems that would be disabled. For example, nurses might lose the ability to mark medications as pending discontinuation. Other complex functionality such as scheduling and length of stay orders may not translate through an interfaced MAR system. Even when information can be sent, received, and stored, it may not always be interpreted the same way in both systems. With any interface, there are more “working parts,” and, therefore, a higher probability of downtime. The downtime procedure varies depending on whether one system, both systems, and/or the interface is down. Reconciling data after a downtime in an interfaced system would be more complicated and tedious than recovering from a downtime in a single system. Due to these considerations it is our belief that an interface between two MAR systems cannot be safely or successfully implemented. For this reason Epic will not attempt this type of interface. A majority of this article is comprised of statements from professionals in the industry. It outlines some unbiased, clearly pro-Epic facts such as ‘a conflict of interest may be unavoidable’ and that the goal of interoperability is ‘a difficult task’. And yet there are some here who dismiss the material and call it bias. I call it even-handed. Let’s look at what we have here. There is a former employee who believes Epic is in the business of establishing a monopoly as opposed to attaining goals in line with administration policies. Another who says the problem doesn’t lie with Epic, but that their technology is simply behind other technologies. Another who says it isn’t just Epic that would struggle to achieve those goals. And one more who thinks it’s money, as with any company, that causes the conflict. The rest of the article raises questions and concerns about a conflict. It doesn’t really ring of a right-wing hit job. Hate to dignify all this with a response, but here goes. Of course healthcare is political. 1. Of or relating to the government or the public affairs of a country. healthcare concerns the public affairs of a country. The question I want to ask is why we bother listening to (commenting on, engaging with) people whose only claim to expertise is ‘outsider’ status. I have better things to do with my time than read trite poorly researched vague arguments. (though apparently I don’t have better things to do with my time than respond to said arguments, so maybe they have value after all). Look, I’ve been working with Epic for a while. I don’t know how to break this to you, but they interoperate just fine. Sure, like any system, there are limitations. Unfortunately many of these limitations are financial. Yes, it is cheaper to buy the whole Epic suite than to try to get similar functionality from a mish mash of products. And it isn’t just Epic that is choosing not to interoperate, but their customers who have to decide if its easier/safer/cheaper to get desired functionality from one vendor, or several. Epic will do work if customers pay them. Customers often wisely choose not to pay. These customers make a financial decision when they choose Epic. If it wasn’t in their best interest, they wouldn’t do it. You know, if you really want to fix things why you propose letting the federal government eminent domain Epic for the public good, and make it mandatory! Then everyone could use it free! And it could interoperate with itself everywhere! Think of the money we could save! Re: Interoperability, ONC is clearly missing the boat by not pushing cloud-based technology. It’s secure, fast, and vendor-neutral. The government would certainly not be the first institution/company/firm that Epic has bought its way into to achieve desired results. I’ll let others address the factual and interpretive flaws, such as they are, in Rusty Weiss’ piece. What blows my mind is that he can think of Epic as a “left-wing company.” Rusty, you’re probably too young to have lived through the 60’s (or the 30’s for that matter) but your idea of left wing is kind of quaint. Emma Goldman, Angela Davis, Lenora Fulani, Lucy Parsons…Those were some left-wing women! Calling Judy Davis a “left-winger” is like calling Kenny G. a jazz musician. I’m not praising left-wingers (or criticizing Kenny G.), I’m just saying your political thermostat is broken. Rusty – A series of cherry-picked quotes that are in line with the premise of your article without a single refuting one? Hardly a ‘fair and balanced’ approach. If I want to read something on standards, there are other and much more knowledgeable places that I will look. Epic still has less than a 20% market share of all HIS installs in the US and wouldn’t begin to fun afoul of any of the revised HHI thresholds that were updated last year by the FTC & DOJ regarding market concentration. Rusty doesn’t know what he is talking about. When the federal government refers to “interoperability”, it is referring to communication between separate organizations, NOT communication within a hospital. Actually, Epic is a leader when it comes to information exchange between separate organizations. Also, Rusty’s comments about PACs systems are totally wrong. Having tried to interface to PACS systems, I can tell you that those vendors are completely inflexible. It is very difficult to integrate with a PACS vendor. Rusty is simply making a feeble attempt at politicizing the work of the policy committee, and he is trying to discredit its work. Why would someone attack the work of ONC’s HIT policy committee? They exist to listen to and ignore experts on usability, interoperability, data standards. Then the committee does what the vendors want. Follow the money. I’ve got one person attributing a quote to me that was clearly said by someone else, and another that says the quotes are cherry picked without knowing who I interviewed or what was asked. Every person interviewed for this piece has expressed thanks for a job well done. Again, if they feel anything was cherry picked, they are welcome to dispute. It’s amazing that when a poltical topic is discussed, reading comprehension skills fly out the window. Argue on merits, not on your own perceived bias. How can you say that Judy Faulkner is not left-wing?! She called for a boycott of Wisconsin Manufacturers and Commerce in 2008 because she didn’t agree with their politics, and even went so far as to have her construction contractor resign from their board. Just this past spring she reviewed the list of donors who gave to the Republican governor, and refuses to do business with them or use them as vendors. She uses her power to further her own agenda, which is absolutely left-wing. She once said during a staff meeting that she supports charging $8 for an Advil in a hospital to make up for all of the uninsured patients. The problem with this article and the comments is that the author failed to define the difference between INTEGRATION and INTEROPERABILITY. From HIMSS’ website: “Integration is the arrangement of an organization’s information systems in way that allows them to communicate efficiently and effectively and brings together related parts into a single system. Interoperability is the ability of health information systems to work together within and across organizational boundaries in order to advance the effective delivery of healthcare for individuals and communities. Epic certainly has an interest in pushing INTEGRATION within the healthcare organization since they sell an integrated product. However, the idea that the company could or would attempt to eliminate INTEROPERABILITY or make it more difficult makes no sense. On a side note, I think it’s fair to say that a simple fact such as campaign donations is a correlation and doesn’t necessarily demonstrate causality. Another correlation might be the fact that Epic is the fastest growing HIT vendor, has the highest ratings from independent agencies such as KLAS, and the most HIMSS Stage 7 clients of any vendor out there. I guess conservatives just struggle with the concept that a successfull business leader can somehow not be part of their camp. Funny how Judy donates to liberal causes, yet runs her business like an arch conservative. Anyone who thinks it is a good idea to have one, of many, HIT vendor CEOs on the board is just foolish. I am not a Health Care IT professional, so this is directed towards those professionals. Here is my question- SHOULD I be concerned if my doctor uses EPIC but my surgeon doesn;t? I mean, will the surgeon, if they use a different software platform than my doctor (IF she uses Epic), be ABLE to share data easily with my doctor? Secondly, I have also heard (is it true?) that there is a new rule coming down that says all records have to be shared with the health and human services department? If this is true and, supposing Epic gets that contract, would those providers who don’t USE Epic be able to comply with this rule? I would assume that HHS would ONLY pick a vendor that allows for sharing data acorss platforms, so I doubt I really need to worry about this. As for her politics, who cares. Does she run a good company and do they have a good platform? That’s all that matters, although the idea that there might be a problem with sharing data acorss platforms is troubling, if it is true.